Annamae Keefer was the recipient of the Home Arts Department trophy having received the most blue ribbons. 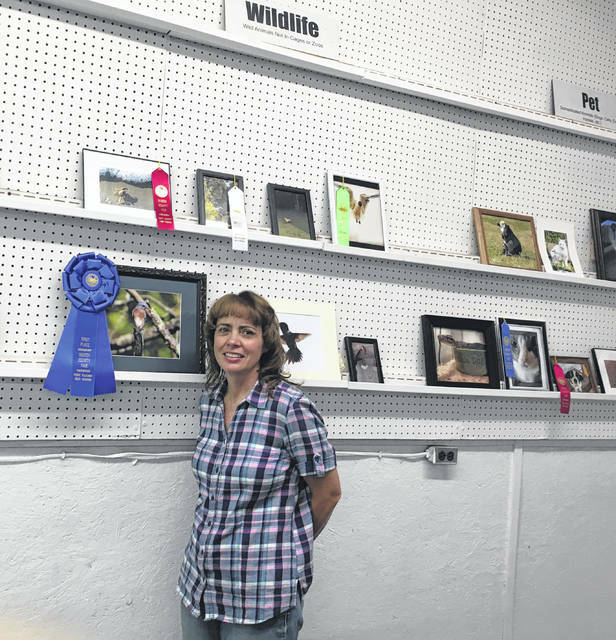 Angie Nelson with her “Best in Show” wildlife photograph. 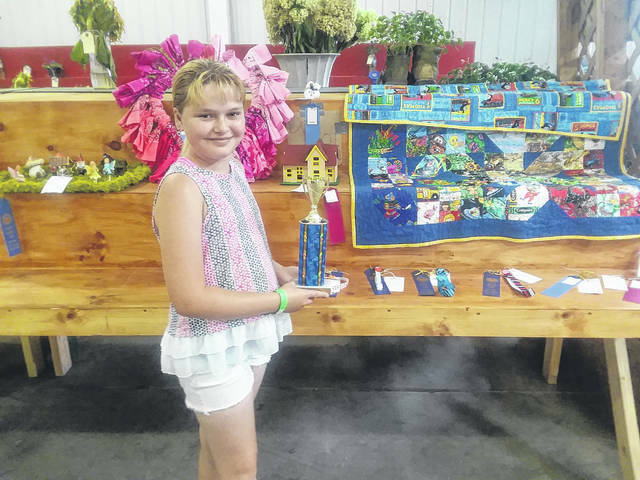 POINT PLEASANT — The Mason County Fair provides several ways for individuals to embrace and showcase their artistic side. Whether individuals are a fan of the photographic arts, home arts, culinary arts, or open artwork, they can showcase their skills and submit their work in competition against other local artisans. Home Arts is a department in which artisans of home crafting may showcase their skills. Home arts has 10 categories including sewing, knitting, crocheting, under 12 painting and drawing, over 12 painting and drawing, wood work, hobbies, over 12 models, under 12 models, and over 12 leggo’s. One trophy is awarded to the exhibitor winning the most blue ribbons in the Home Arts Department. Entries can receive a blue ribbon, $3 cash prize; red ribbon, $2 cash prize; white ribbon, $1 cash prize; green ribbon, participation. This year, Annamae Keefer was the recipient of the Home Arts Department trophy having received the most blue ribbons. Angela Nelson shared she has been competing in the photographic arts for about 20 years and this year was awarded with a “Best of Show” rosette ribbon. The awards given are as follows: Best of Show, rosette ribbon, $5 cash prize; first runner up, $4 cash prize; second runner up, $4 cash prize; first place of each category, blue ribbon, $3 cash prize; second place of each category, red ribbon, $2 cash prize; third place of each category, white ribbon; honorable mention, green ribbon. Nelson explained she typically submits her photographs in either the wildlife class or landscape class. There are 12 classes which individuals can submit their work: class one, portraits; class two, children; class three, groups or events; class four, travel; class five, landscape; class six, nature; class seven, wildlife; class eight, pets; class nine, architecture; class 10, flowers; class 11, 2017 Mason County Fair; class 12, miscellaneous. Nelson said the photograph she submitted this year was in class seven, wildlife. She explained she was outdoors looking to photograph a turkey or deer, but saw a bird that captured her eye instead. Nelson commented she has been interested in photography since she was 12 years old when she received her very first camera. Ed Lowe, assistant chair of the Photographic Arts Exhibit, commented there were 144 entries in this years’ exhibit, up from 124 last year. Lowe explained the fair board members renovated the Photographic Arts Exhibit area prior to this year’s fair and next year the exhibit area should have new lighting. Lowe serves on a committee with J.T. Holland, committee chair, and Sarah Waddell, assistant chair.